Layers of co-ordinated patterned papers can be used to create a stunning background for your photos and give your page depth. In the layout below I have used several different papers from different manufacturers to highlight the natural beauty of my photos. Play around with layers. 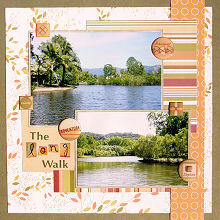 It's a great way to use up some scraps while creating beautiful pages for your albums. This layout was created using khaki cardstock, Scrapworks Oxford Thicket paper, Piggy Tales Striped paper, Scenic Route Charlotte Marg Stripe paper, Chatterbox Greenhouse Stripes paper, the underside of Chatterbox Loft Soft Flowering Vine paper, Daisy D's Khaki paper, alphabet stickers and All My Memories Adventure Epoxy stickers. Use the khaki cardstock as your background. Cut a square of Scrapworks Oxford Thicket paper measuring approximately 28cm by 28cm. Centre on your page and adhere. Cut a strip of Scenic Route Charlotte Marg Stripe paper approximately 4.5cm wide. Adhere down the right side of the page approximately 2.5cm from the right edge. Do not adhere the bottom third - you will want to tuck something under it later. Cut a piece of Piggy Tales Striped paper approximately 15cm by 15cm. Adhere towards the top right of your page (approximately 3cm from the top edge and 3.5cm from the right edge). Make sure your stripes are horizontal. Cut a piece of the underside of Chatterbox Loft Soft Flowering Vine paper approximately 8cm by 9cm. Adhere towards the bottom left of your page (approximately 3.5cm from the left edge and 7cm from the bottom edge). Cut a piece of Chatterbox Greenhouse Stripes paper approximately 17cm by 3cm. Adhere horizontally approximately 4cm from the bottom edge of your page and 7.5cm from the left edge. Tuck it under your strip of orange paper and then glue your orange paper down. Mat both photos with Daisy D's Khaki paper. Place the large photo in the top left corner approximately 4cm from the top and left edges. Place the smaller photo towards the bottom right corner, approximately 4cm from the right edge and 5cm from the bottom edge. It will overlap with your large photo. Use alphabet stickers to write your title on the Chatterbox Loft Soft Flowering Vine paper, as shown in the layout above. Finally, decorate your page with All My Memories Adventure Epoxy stickers, as shown in the layout above.